The ceiling fan Kisa 105 cm / 41" in antique brass for low ceilings combines tradition and future. Equipped with state-of-the-art technology encased by classic design this device offers exceptional value for money. With a total diameter of 105 cm / 41" the Kisa is recommended for rooms with a size of ca. 15 m². Thanks to the small dimensions of only 32 cm / 12.5" overall lenth it can be installed in places with low ceilings below the standard room height. The top-quality motor of the Kisa operates on 3 speed settings and provides a pleasant indoor climate throughout the whole year with the option to switch between forward and reverse motion. During summer it ensures cooling despite even extremely high temperatures. On cold days it redistributes warm air that accumulates beneath the ceiling back into the entire room, preventing cold and draught spots. The Kisa is goes easy on the environment and works with a high level of energy efficiency, saving up to 30 % heating costs. 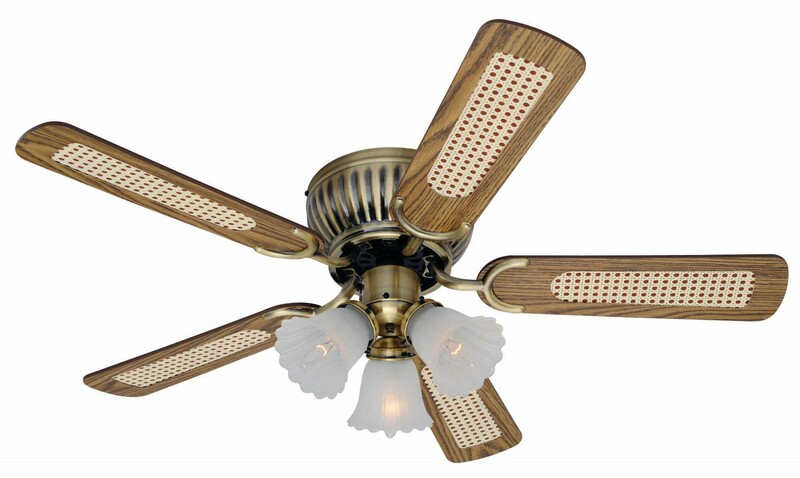 All features of this ceiling fan are controlled with an included pull cord. The Kisa can also be used with an optional wall control unit for even more comfort. It operates quietly and without any audible motor sounds even on on the highest speed setting with 230 revolutions per minute. 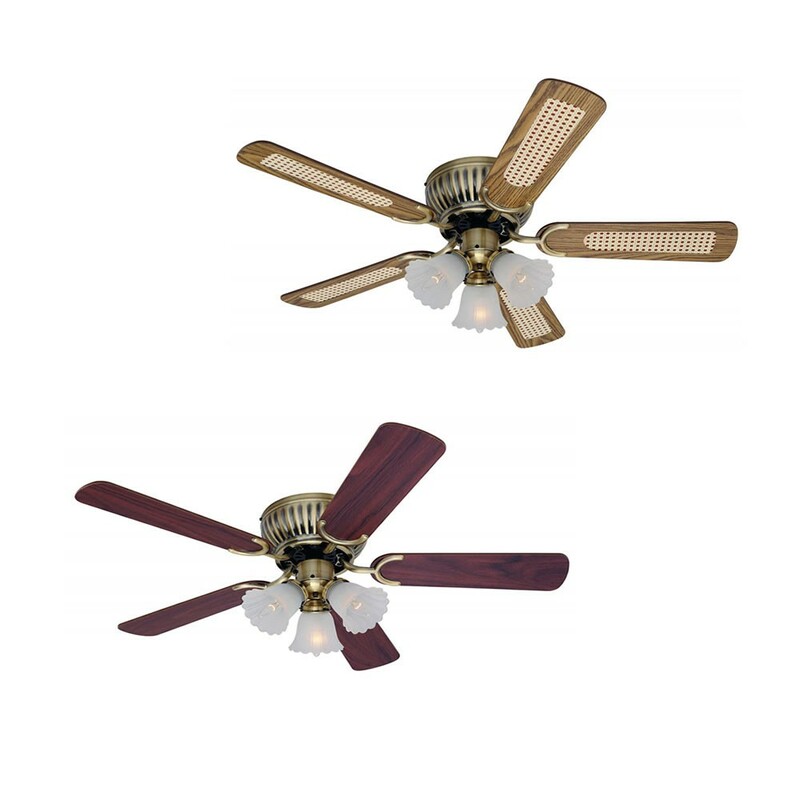 With a stylish retro look of both the housing in antique brass and five reversible blades in mahogany or oak with cane the Kisa is the perfect addition to interior decoration consisting mainly of old solid wood or period furniture. Furthermore the three lamp spots are an atmospheric lighting element. 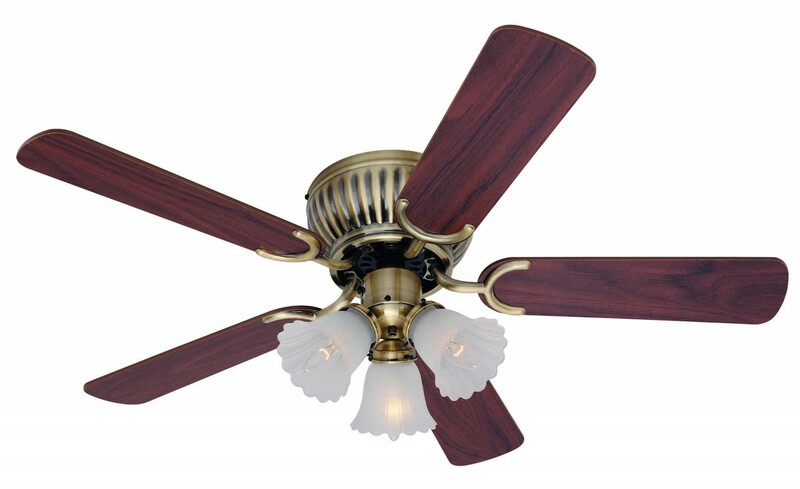 Diameter: 105 cm / 41"
Dimensions ceiling to bottom of light kit: 32.0 cm / 12.5"
Diameter motor housing: 22.7 cm / 8.9"
The lighting is suitable for light bulbs of the energy classes: E - A++!